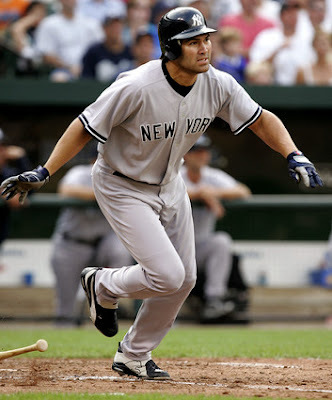 An Opinion On Sports: Johnny Damon: Could He Become A Brave? The Atlanta Braves made an initial offer to free agent Johnny Damon, they had their All-Star third baseman, Chipper Jones, make a recruiting call to him, and now they have reportedly made a more competitive second offer to him. It appears that Atlanta is aggressively trying to sign Damon. The second offer is said to be at least a match to the $6 million offered by the Yankees. This action by the Braves does make a lot of sense. Even though they have a couple of bona fide young outfielders in the minors who are close to being ready for the big leagues, the addition of Damon would allow those guys to develop further in the minors and not be rushed up to Atlanta. Damon would also provide the lead-off hitter Atlanta has been sorely missing, and his veteran leadership in the clubhouse would prove to be invaluable. The offer is only for one year, and that might be as long as Atlanta would need the veteran outfielder. No one is sure how much money the Braves have left in their budget, but spending enough to sign Johnny Damon could prove to be worth the price.